Where to buy Jamón ibérico Bellota, Pata negra and Serrano in Barcelona? Jamón ibérico de Bellota experts in Barcelona. Trust. More than 30 year’s ham-selling in Barcelona. History. Jamonarium as Bellota and Serrano hams reference. Brand. 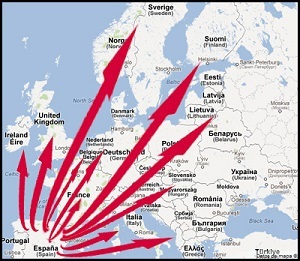 Gourmet and Ibérico hams shipping all over Europe. Reliability. Visiting Barcelona? Welcome to Pata negra paradise. Our shop. 1 - Where to buy Jamón Ibérico Bellota, Pata negra and Serrano in Barcelona? 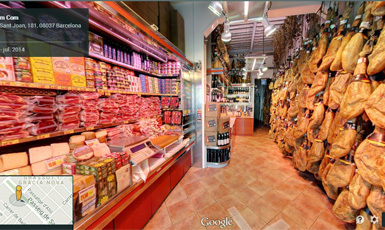 Our shop in Barcelona is a reference as Ibérico Bellota and Serrano hams selling. Customers from all over Europe come to our shop in Barcelona to get their hams or shoulders. From 2011, our best gourmet products may be acquired in our online shop. Our shop in Barcelona is a smell, sight and taste delight. 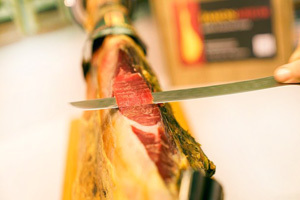 Visit us to try the best Ibérico products. We will tell every secret to distinguish among top quality hams and sausages. 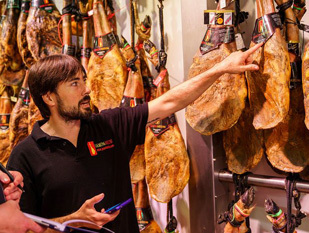 We are the Ibérico Bellota and Serrano hams reference in Barcelona thanks to our experience, as well as the trust placed in our products and services by our clients. Buying ham is an act of faith. There are many similar labels, but each ham or shoulder is unique, so it is about trusting who is selecting your piece as an expert. 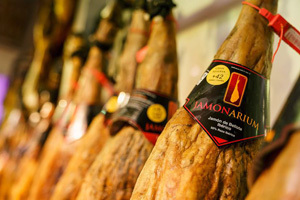 In Jamonarium we say nothing but the truth, even when it is dry or over-fatty. All our products are certified. We select them manually, one by one, to ensure better quality for each sort of product so we only sell ham and gourmet online and in our Barcelona shop. Is all about confidence. Carlos. Product & logistics. "The architect of Jamonarium, building bridges out and about"
Alex. Marketing & online sales. "The diver of Jamonarium, always searching for new unexplored seas"
Sergi. Store Manager in Barcelona. "The Jamonarium's runner, slowly but surely, always wins"
Sergi. Store and Cellar. "The Jamonarium's magician, he explains a wine, then you imagine it, then you want it"
Anabel. Administration. "The calm of Jamonarium, everything is under her eficient control"
Sara. Customer care and Transport. "The voice of Jamonarium, answers even to the stones"
Our beginnings date back in the 1950s. 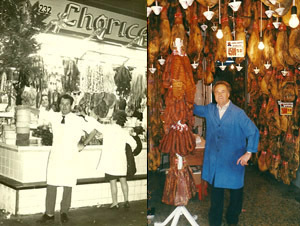 The founder of Pernil181, Antonio Ferrer, started as pork butcher working in different markets in Barcelona, as in La Boqueria or Mercat de Felip II, as well as in Mas Charcuteros. In 1988, he opened Pernil181 in Passeig Sant Joan 181 in Barcelona. Since then, many clients and, mainly hams came in. In 2000, second generation takes the control of the store in Barcelona. And in 2011, Jamonarium has been created as a brand with the online shop. At the beginning, we were only selling hams and shoulders. Afterwards, the catalogue has been extended to wines, cheese, gourmet cans, seafood and other products. Jamonarium has been created and evoluted along the years as a brand. Now we trade hams and shoulders of every tipe: Ibéricos y Serranos, Bellota and Cebo, Pata Negra 100% and 50% Ibérico. Every ham has been elaborated with the best procedures and slowly cured. Our brand is certified and registered to guarantee quality to our clients. Our brand is only distributed by us in order to ensure hams and shoulders best quality. In 2010, we started to sell hams, shoulders and sausages in Europe and we have become the online shop reference in France, Germany, Italy, United Kingdon, Denmark and Holland, among others. We work with the best courier in each country and we closely track all our shipments. See shipping costs here. 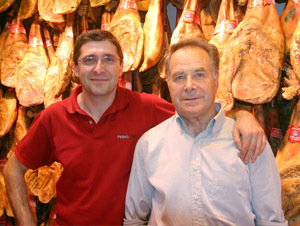 We are the better valued online Ibérico Bellota hams store by the European clients. See opinions. Visit our shop in Barcelona, Pernil181 - Jamonarium, placed in Passeig Sant Joan 181. We will be very pleased to meet you, and you will see many hams and ibérico products. Our shop is like a ham museum. The location of our shop is privileged. 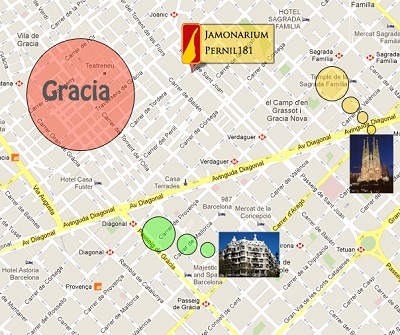 We are between Gràcia and Sagrada Familia . 10 minutes walking from Sagrada Familia of Antonio Gaudí and 5 minutes from Gràcia neighbourhood, some of the most frequented areas by tourists and inhabitants of Barcelona. You will find countless lovely restaurants and squares to enjoy the most typical terrace of Barcelona nightlife. 15 minutes walking, we will find La Pedrera or Casa Milà from Antonio Gaudí, in Passeig de Gràcia, one of the most important avenues of Barcelona. Around 20 minutes walking, there is Park Güell in the north of Barcelona. From this park there are spectacular views of Barcelona, forest area and monuments designed by Antoni Gaudi. Among those monuments, we should highlight dragon, columns, pavilion and decorated benches. Opening hours: (Mon-Fri) 9:30 - 14h and 16:30 - 20h and Saturdays 10-14h. You can collect your orders in our hams and sausages shop in Barcelona, with no shipping cost. See shipping costs. Our shop is a ham reference in Barcelona and Gràcia's neighbourhood per its 30 years history, as well as its excellent service and quality. 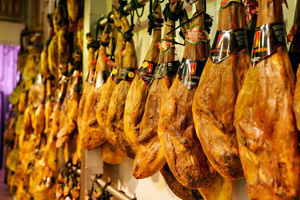 We suggest different ham-types tasting as a experience during your stay in Barcelona. Tastings are done in small groups and guided by our ham expert.